It all started with our intention to make the Genomic Based Research and Development Centre for Health more accessible for the people with hearing loss who are participating in hearing research, advisory committees, and interactive education sessions. We had become increasingly aware of how community interaction is impacted by hearing loss, which creates barriers not only to accurate hearing and understanding of communication, but to privacy of communication, to self-sufficiency and confidence in conducting one’s daily business, and to safety. For sessions at the research centre, we had been using Computer Assisted Real Time Captioning (CART) regularly, but wanted to add technology for direct audio input to further improve accessibility. As we investigated, we got very interested in hearing loops. Although loops have been around for about 80 years, they are far from obsolete. With improvements in equipment and more sophisticated design options to permit good signal during a wide variety of activities, and increasing recognition of the importance of accessibility and full inclusion, there has been a resurgence of interest in this versatile technology. It can be used in large and small rooms alike, and also at counters, in vehicles and homes, providing accessibility for multiple environments. Sound received from a good induction loop is clear and there is no transmission delay to interfere with the simultaneous use of speech reading skills if needed. Signal to noise ratio is improved by approximately 25 dB, a substantial improvement in environments with poor acoustics, or where the listener is separated from the speaker by distance or a plexiglass counter window, or where even light to moderate background noise is present. The signal from a hearing loop can be accessed through an induction loop receiver and headphones, or through headphones fitted with T-coils, but for many people a particular appeal of looping is seamless real-time direct connection to the T-coil of the hearing aids. Eliminating the necessity of separate receivers makes usage simple for the user and reduces investment and maintenance cost for the organization providing accessibility. Furthermore, better hearing through looping can be achieved whether or not the user has chosen to disclose their hearing loss in public. This is accessibility which is functional and empowering. Audiologist Juliette Sterkens is the Hearing Loop Advocate for Hearing Loss Association of America (HLAA), and has shown by example how education and demonstration can be highly successful in initiating awareness and uptake of technology which allows hearing accessibility far beyond what hearing aids used alone can provide. As community members experience the benefit of improved hearing through looping and learn how T-coils can significantly extend benefit received from hearing aids in those challenging community settings, momentum grows and people with hearing loss are empowered to advocate for further locations to be looped and for hearing aids equipped with T-coils. Sterken’s approach, experience, and information on the HLAA website are great resources for those interested in hearing loops but unsure of how to get started. Grand Falls-Windsor, Central Newfoundland’s largest town, has a modest population of 14,000. Multiply this by 10 for the catchment population from smaller communities who access a broad variety of health, financial, legal, recreational, and retail services in “GFW.” By the late 1990s the paper mill, once the town’s largest employer, had been steadily reducing its operations, employees and economic contribution for a decade. Seeing the writing on the wall, the town decided to create a climate where knowledge-based economic development and innovation could thrive, and has provided a home for the Genomic Based Research and Development Centre for Health, of which Suite Q: About Hearing is the seminal research facility. Our mandates include the advancement of scientific knowledge of hearing loss cause and effects, knowledge translation of scientific discovery and innovation, and commercial development of products which improve outcome for hearing loss. Therefore, even while we collect the data pertinent to current projects, we are constantly scanning the environment to identify gaps and opportunities. As staff audiologist, Jill Lowther, spearheaded our exploration of hearing loops to improve hearing accessibility for events in our own facility, we quickly realized that this simple objective could be the cornerstone for a larger mission to facilitate knowledge translation of accessibility technology at multiple locations in our community. We saw that there would be a significant advantage if we elected to achieve our goal with community partners to increase uptake of T-coils and other accessibility solutions well beyond what the capacity of the research centre could achieve alone. Options for installation of a loop at our facility also stimulated strategic thinking. We could have contracted a company of experienced installers but we would have had to depend on remote professionals for help if problems arose. We wanted to be further ahead on loops applicable to other locations in the community and be knowledgeable about site assessment and installation. We decided instead to contract training in loop installation and open up the training opportunity to interested members of the community as well as audiologists from the centre, in order to build expertise capacity in the community for future looping projects. At this point, we turned to our friends and partners at Canadian Hard of Hearing Association for some ideas and support. Executive director Christopher Sutton, a well-informed advocate for barrier-free design, agreed to help us introduce the community to the need for hearing accessibility. President Myrtle Barrett introduced us to Lee Ramsdell, an active member of CHHA Edmonton, and a great advocate and technical expert for looping. Both encouraged us to promote our emerging community- based strategy as an accessibility initiative rather than a looping initiative, to ensure people realize that accessibility is the key purpose whatever method is used. Lee Ramsdell, a retired audio technician at the University of Alberta, got interested in our project and offered help. He helped us identify which training and equipment would meet our needs, find a good supplier, and took on the role of trainer and facilitator to get us started. 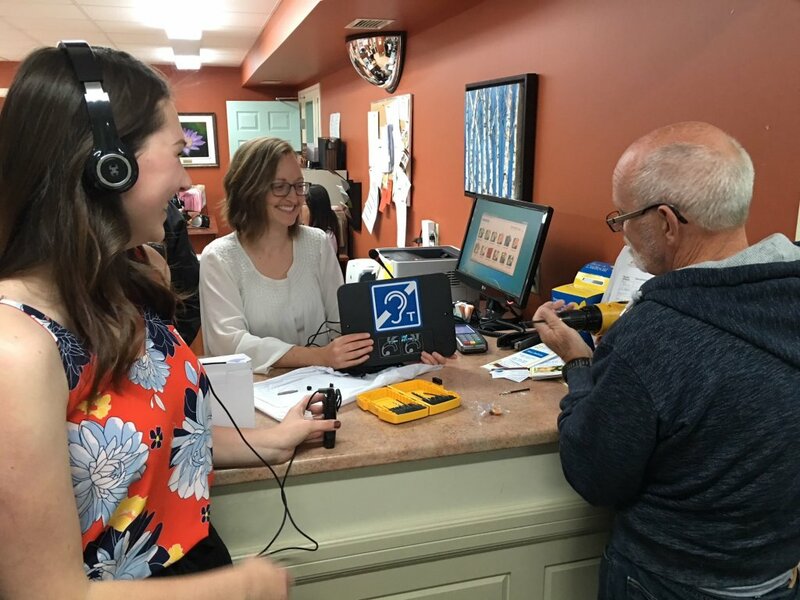 With support from our local CHHA branch and community members, we decided to bring Lee to GFW to train our audiology staff and student, and additional community members. To ensure opportunities for hands on learning during our session, we first sent an invitation to the Town of Grand Falls-Windsor to ask them to allow us to install a counter loop at the town office wicket for the cost of the equipment alone, to promote accessibility and inclusion for people with hearing loss. Their prompt and enthusiastic response gave an instant boost to the accessibility initiative, transforming it to a truly community-based project in which the town’s administration was ready to lead by example. The phrase “an accessible town starts with an accessible town hall” was created by Jill to acknowledge and promote the town’s action on their facebook page. Many other businesses were offered the same opportunity and we received one other response from Karla Tucker, owner of Maico Hearing Service, who decided to have a counter loop installed in the GFW clinic. Even before our three days of training and installation practice at the end of August, we were planning the launch of the accessibility initiative for late September, to coordinate with the availability of CHHA’s president and executive director. We realized that awareness building was essential to help the community understand the motivation for an accessibility initiative and some of the technology that supports accessibility. Staff member Holly Rowsell identified the ways in which hearing loss had caused her to adapt in her daily community life, adaptations which are common or “normal” to many people with hearing loss, but which reduce interaction, independence and confidence, and should not be accepted as “normal.” Holly and pre-audiology student Taylor Burt then turned these adaptations into a thought-provoking poster to identify the need for accessibility. We invited a broad cross section of people with hearing loss, service providers and representatives of businesses and the town to attend a panel presentation and discussion themed “Living with Hearing Loss: Impact on community life”, followed by refreshments and displays of accessibility equipment for hearing loss. We borrowed samples of visual/tactile smoke alarms and home alerting systems from CHHA-NL and prepared handouts about accessibility issues, applicable technology and where to obtain them. Members of the local “Exploits Valley Branch” of CHHA were designated to demonstrate pocket talkers and provide information about their loaner program. We also searched for community organizations already providing some form of hearing accessibility, and found that while no hearing loops were in use, some churches and theatres were providing other options for accessibility. We invited these organizations to participate in the community initiative, and be recognized as “Accessibility Partners,” to acknowledge and publicize the importance of their action to provide accessibility. Jill Lowther, Taylor Burt, and Lee Ramsdell installing a counter loop at the town hall service desk. Training conducted by Lee gave us skills and confidence to install and demonstrate counter loops, to assess electro-magnetic interference in an area and to lay out and activate our centre’s new perimeter loop in simple configurations appropriate to the space and usage. We were introduced to IEC-60118-4, the standards for hearing loop performance, and learned to reference these standards in measuring interference and signal strength to ensure effective loop performance. Lee also introduced us to two-phase loops and other types of loop design, which can be used to reduce or eliminate inconsistency of signal caused by activities which change the physical orientation of the listener’s T-coil (such as a yoga class) attenuating effects of metal in a room’s construction, interference from electric musical instruments, and also to control room spill and provide more uniform coverage for large spacesLee also arranged for Thomas Plahn of Univoxaudio (Sweden) to conduct training via Skype on Univox’s software for designing more complex loops. Our launch meeting was held at the end of September. By then we had completed training, installed two counter loops, and identified six existing Accessibility Partners in the community, plus one new one to announce at the meeting, after the decision of a local medical clinic to install a loop at their office. Our perimeter loop was installed and additional accessibility was provided through basic amplification and CART. Induction loop listening headsets were provided to demonstrate the loop for those without a T-coil to try it out. Our novice status in looping was also demonstrated as we discovered that part of the area we had looped had unexpectedly high interference! We have since discovered the cause and how to work around it. Our panelists included Michelle Edwards, local audiologist, staff member Holly Rowsell, and CHHA’s national executive director Christopher Sutton. Their personal and professional perspectives on hearing loss helped to create awareness of the principles of barrier-free design, Canada’s recently tabled Bill C-31 accessibility legislation, and places where hearing accessible technology is common and benefiting many people. Challenges of communicating encountered by people with hearing loss on a daily basis were discussed by the panel with other meeting participants, as well as adaptive strategies which serve as coping mechanisms but which may prevent others from perceiving these communication problems. Accessibility partners were invited to share what prompted them to take action. Theatre owner Sean Feener reported that based on observed need he had recently purchased two captiview units to make movies more accessible for patrons with hearing loss, and was pleased with the positive response from community members. Meeting participants were invited to consider taking an active role to help the initiative to develop and all were promised a follow-up summary and updates on progress of the initiative. After the formal discussion, refreshments provided an informal opportunity to mingle and view the demonstrations of accessibility technology. Feedback indicated that participants had learned a lot about hearing loss and accessibility and were interested in supporting the initiative. Three people volunteered to get involved directly and are now involved in strategic planning to radically increase hearing accessibility in our town and region. Anticipating increased demand for consultation and installation of accessibility technology, we decided to start immediately to develop further capacity for technical support. Several additional community members have been recruited to do additional technical training on looping rooms and larger areas, including recreation staff who are responsible for all the set-up of town public events, including amplification. Three high school student volunteers have been trained to demonstrate and install counter loops. We have established a technical team at the centre to ensure preparation and smooth functioning of all accessibility technology at our events, and have combined public amplification, looping, CART and FM at recent events successfully with their assistance. Participants are asked to try the various accessibility options to help us learn the best configuration and set-up for optimum listening benefit. Not only is the feedback helpful, but engaging participants to evaluate benefit and contribute to improvement of our set-up also helps to introduce people to technology which may benefit them but which they might be a bit shy to reach for independently. Providing accessibility is a definitely a learning process, and we are appreciative of the creative trouble-shooting skills of our tech team leader Bruce Rowsell, and the technical knowledge which other friends of the research centre have freely shared. We hope to work with the Town of GFW event staff to demonstrate hearing looping at one of the town-sponsored free outdoor concerts in the park this coming summer. Our goal is that business and service organizations will come to consider hearing accessibility in their facilities as an essential component of customer service. We are convinced that advocacy by consumers is critical to establish awareness of the competitive advantage of providing accessibility. We are already seeing examples of the power of demand by potential users. After the launch meeting, one participant with hearing loss requested the owner of her drugstore to consider putting in a hearing loop for the pharmacy counter Suite Q: About Hearing will support consumers and the strategic committee to advocate for accessibility, and will actively market the opportunity for adopters to be publicly acknowledged and promoted as an accessibility partners. In conjunction with future training sessions, we will again offer a cost-saving incentive of installation at no extra cost for a limited number of proactive adopters. This will provide practice sites as we train more community members while simultaneously increasing available looped locations. As momentum builds, we see potential for a community entrepreneur to take the training further and offer installations for a fee, in our community and beyond. We are really pleased at how this initiative has begun, and look forward to seeing how it develops. We are very appreciative of the town’s enthusiastic support and the hard work of staff and community volunteers who have got us this far. By mid 2019 we anticipate that we will have further augmented the capacity of the initiative in technical resources and skills, and will have a completed strategic plan. Within the year we would like to see engaged community members and partners take on the leadership roles and the research and development centre shift to a supporting role. By 2020 we hope to be able to report more hearing accessible locations and events, increased uptake of accessible smoke alarms, a rise in demand for T-coils in hearing aids, well-publicized acknowledgement of accessibility partners, and positive feedback from those who are benefiting from improved accessibility. Who is responsible for accessibility? If we think of accessibility as a special concession to address the impact of disabilities we don’t have ourselves, we may think that it is the job of others. However, I particularly like one description, used by the Accessibility, Accomodation and Adpative Computer Technology program (AAACT – of Shared Services Canada) because it reminds us that we all require accessibility to ensure that we can use our skills and abilities most effectively at work and for full participation in community life. “Accessibility means that people with and without disabilities can perceive, understand, navigate and interact with information, services and applications.” In a truly inclusive society, we are all implicated. We have standards and guidelines to help, but there is no exact blueprint for how to go about it. So, we have decided to figure it out by getting strategic together as a community! Anne Griffin, MSc Aud, is a clinical audiologist with the Young genetics research team at Memorial University of Newfoundland, and director of the new centre for Genomic Based Research and Development for Hearing Science in Grand Falls-Windsor, Newfoundland. An audiologist graduate of UBC (MSc Aud 1989), she has lived and worked in Grand Falls-Windsor, Newfoundland and Labrador for 27 years, providing diagnostic and rehabilitation services for hearing loss through public and private healthcare. She has been providing auditory assessment and analysis of audiologic data for Dr. Young and the research team for the past 15 years, and is interested in contributing to improved outcome for hearing loss through better understanding of the mechanisms and vulnerabilities of the auditory system, leading to new solutions for hearing loss. Extensive clinical experience working with families and individuals has convinced her of the relevance of diagnosis and cause to clinical intervention and that people with hearing loss are best served when empowered with information and resources to manage its impact throughout their lives. Anne Griffin also believes that the profession of audiology is ideally positioned to work effectively with all professional and community stakeholders and demonstrate leadership in assisting clients to integrate and maximize the contributions of each. Anne is the recipient of the Canadian Academy of Audiology President’s Award (2010) and several awards from the Canadian Hard of Hearing Association: the Community Recognition Award for Advocacy (CHHA-NL, 2008), the Winnifred C. Cory Award of Merit (CHHA 2010) and a Certificate of Recognition for Service (CHHA-NL 2010).